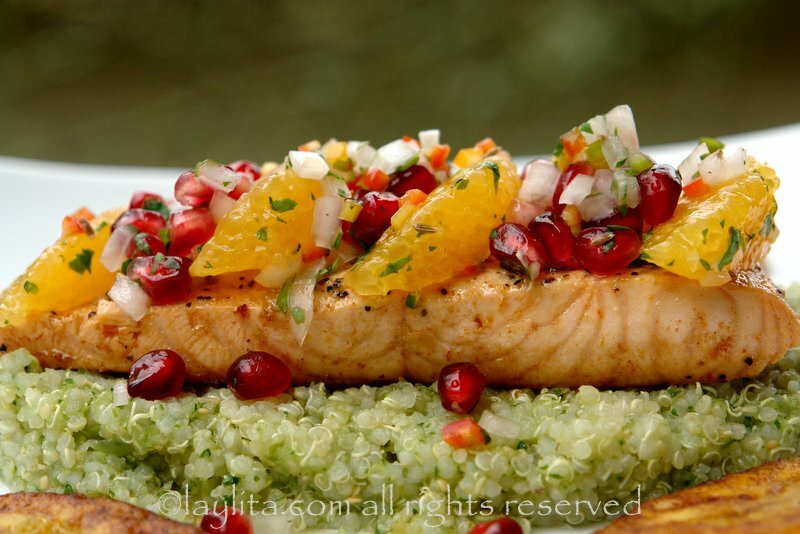 If you love salmon, or fish, and are looking for different ways to prepare it, or different toppings to serve it with, this pan seared salmon with pomegranate and orange salsa is a great option. 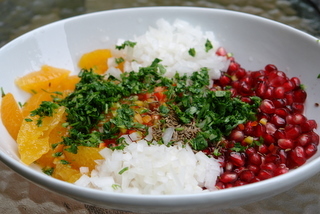 The salsa is is made with a mix of pomegranate, orange, onion, cilantro, hot pepper, lime juice, orange juice, cumin seeds, olive oil, salt and pepper. 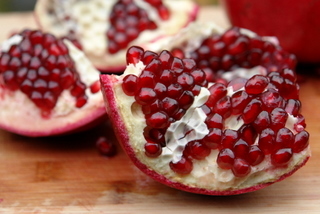 I love pomegranates and am so happy to see how popular they are becoming in the US. Though, I have to say that I do find it somewhat funny that the other day when I bought a pomegranate at the local grocery store, there was actually an instruction booklet on how to correctly open a pomegranate- which makes me think also that there are some very good marketing people behind the popularity of the fruit.So, this pomegranate user manual states that the correct way to open the fruit is to make a slice on the top, then quarter it, and remove the seeds -correct names for the seeds is arils – over a bowl of water. While I do slice the top off, I prefer to make a small cut to break it in half and then another small cut on each section, then I use my hands to break it into quarters -doing it over a bowl of water does help a with the mess part though -, I just find the seeds so beautiful and hate cutting them up, I feel like I’m butchering them. 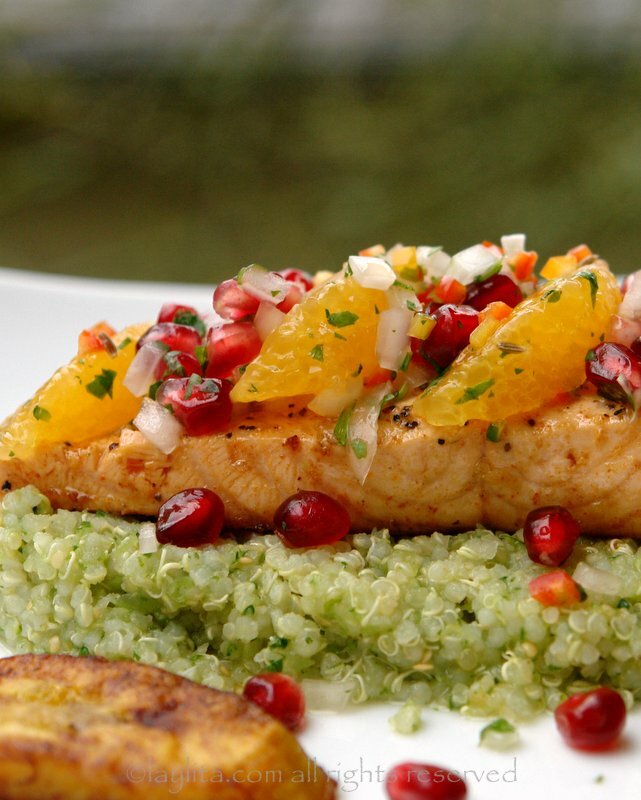 Easy recipe for pan seared salmon topped with a spicy salsa of pomegranate, orange, onion, cilantro, hot pepper, lime juice, orange juice, cumin seeds, olive oil, salt and pepper. Mix the crushed garlic, cayenne pepper, fennel, lime juice, white wine, olive oil, salt and pepper together to prepare a marinade for the fish. Let the fish marinate for 1 to 2 hrs. 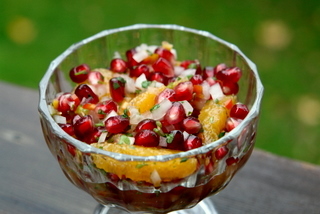 Meanwhile to prepare the pomegranate salsa, combine the pomegranate arils, orange segments, any juice squeezed from the orange membranes, lime juice, diced onion, cilantro, Serrano peppers, cumin seeds, olive oil, salt and pepper. Mix the salsa well and let it rest refrigerated until ready to use. 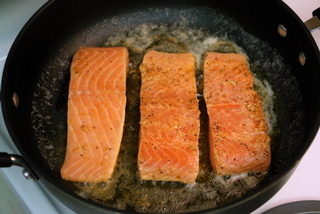 Heat the butter or oil over medium high heat in a large sauté pan, add the salmon fillets and cook until browned on each side and cooked, about 3-5 minutes per side depending on the thickness of the fillets. Serve immediately with the pomegranate salsa on top or on the side. 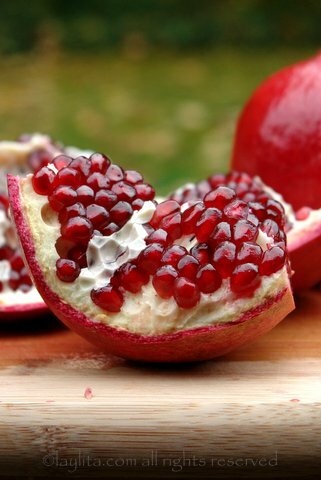 When I was growing up we had pomegranate trees on our farm, my brothers and I loved them and used to fight over them. I remember keeping an eye on the ones that were ripening and waiting for just the right time to pick them before anyone else. After I picked a ripe pomegranate, I would find a quiet place to sit, usually perched up on a branch in a tree – another hobby as a kid was to find good trees to climb – and then eat every single pomegranate seed. There is something special about eating those beautiful sparkling red seeds, it is a double pleasure: both for my eyes and my taste buds; as a little girl it felt like I was eating edible rubies. My family likes fish (a lot) so we eat it at least once or twice a week. Salmon is a favorite for my kids and to keep it from getting boring I like to add a little bit of variation and serve it with different salsas. Since my kids also love pomegranates and oranges I decided to make a slightly spicy salsa with these ingredients to go along with the fish. The combination of salmon with pomegranate and orange salsa might sound a little bit unusual, but trust me, it works! 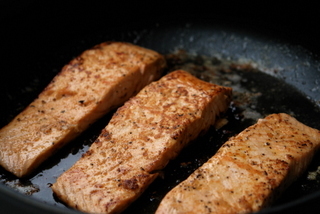 This time I pan seared the salmon fillets, but you can also grill them if you prefer. The pomegranate salsa will go very well with any type of fish, but it is also a great addition to grilled chicken or grilled lamb dishes. I served the salmon with quinoa (mixed with tomatillo and cilantro sauce) and fried ripe plantains. Thank you so much for your wonderful recipes ! 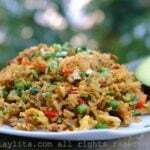 I’m from Quito and I’m always looking to get inspired by your recipes and follow your secrets ! I tried this salsa on top of your hornado for early Thanksgiving last week and it came out absolutely an amazing combination! 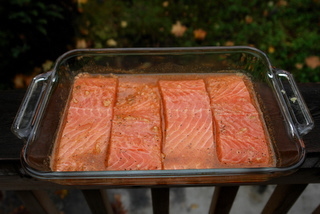 This week I have 14 people and want to try it with the salmon, would you do the salmon in the oven to have a carishina method of not pan searing 14 pieces of salmon and avoid cooling and/or drying ? what temperature would you bake and for how long? And please! keep bringing the wonders of your table to ours! Hi Joanna – I would bake it a high temperature (425-450F) for about 15 minutes, more or less based on the thickness of the fish. This dish turned out to be amazing. I made both the salmon and the quinoa. So easy and fast to make. The flavors blend very well together….very delicious. Thanks for all the amazing recipes you are posting! This is unbelievable!!! I never like fruits in these kind of recipes but after trying some other recipes of yours that I loved, I saw this picture and said it must be delicious! I am making it again tonight and the whole family loves it! I put much less cilantro and cumin because my family is not used to eating it but it is still scrumptious!! Fairly easy and delicious recipe with a fabulous presentation. I made it with tilapia as that was all I had on hand and the salsa was just incredible and beautiful. I can’t wait to try your salsa verde quinoa soon. This is a really great meal. I made the whole thing twice. 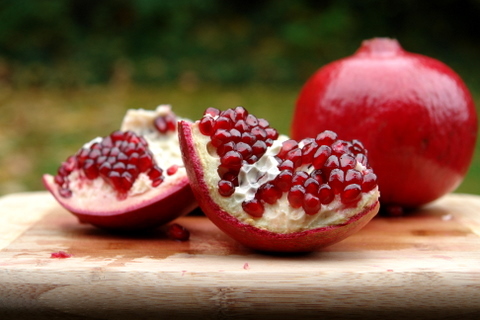 Some stores carry frozen pomegranate arils now, including Whole Foods. I would say I like a little more cilantro in the salsa, and I never found ground fennel (used the seeds instead), but otherwise the salmon, quinoa and plantains are pretty perfect! 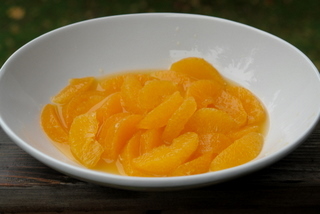 One question, any technique suggestions for making orange supremes? 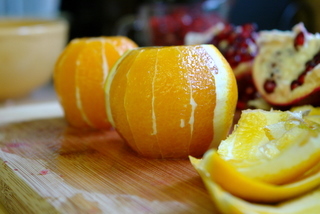 I end up mashing the oranges when I try to get the inner membranes off. great recipe. incredible colors and flavor contrasts. i just made it for my girlfriend for valentine’s day, and it knocked her socks off. 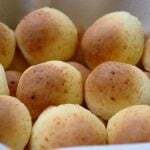 No puedo explicar lo maravilloso que este site, la fotografia es maravillosa me deleito de los platos solo viendolas, las recetas son muy detalladas, con plalabras simples. Seria muy bueno que se pudiera hacer un libro y venderlo. Estoy buscando una receta de alfajores, me la podrian poner. I tried this dish and it came out fantastic. I was not able to use the pomegranate arils because they were not in season, but I substituted pomegranate juice instead. It was still very delicious. My husband fell in love with this dish and talks about it all the time. He is torn between the Pescado Encocado which I also made, and this one. This recipe is great. 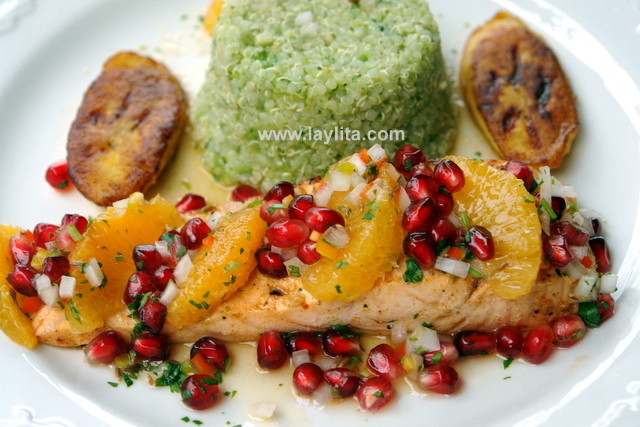 I don’t have pomegranate at home, so I substitute it with mango, and it come out great, the salmon taste so good. I saw your recipe post on some of my friends at facebook. I love to cook as well but have not tried south american or other recipe from Ecuador, or any authentic spanish and mexican dishes. I love different recipes from every culture. Your recipes are refreshing and looks delicious just by looking at the pictures. 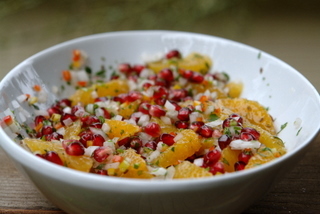 I can’t wait to try this dish with the pomegranate. 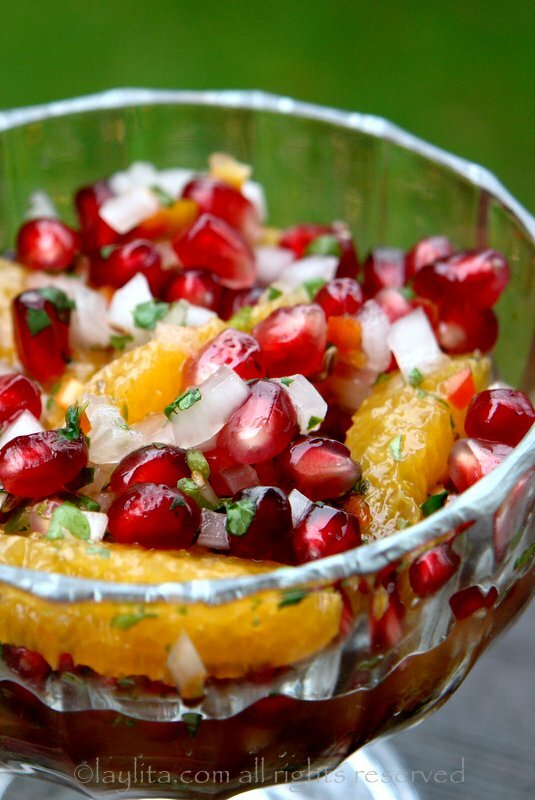 My husband and I love this fruit and since he’s middle eastern he’d love this dish. Thanks for sharing. Keep them coming. This looks like a good one for Valentine’s Day dinner! What a great recipe! 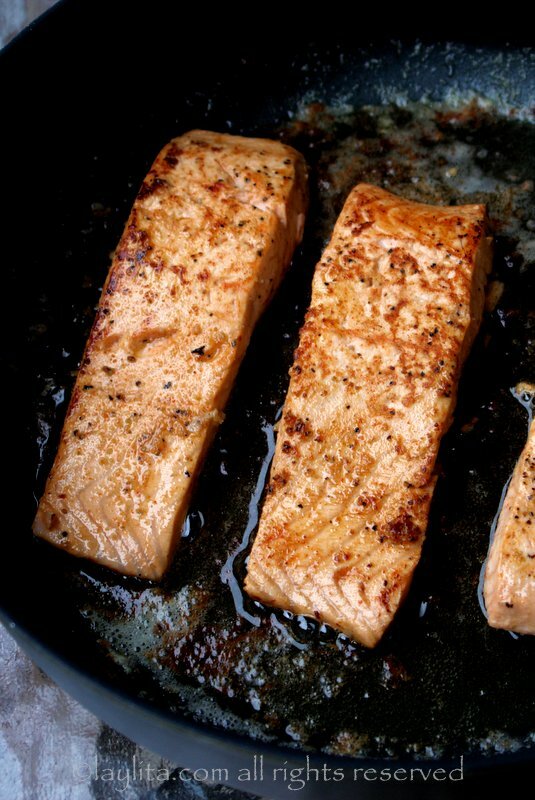 I am always looking for new recipes for salmon and I definitely want to make this. That salsa looks so lovely, I could eat it on it’s own! I made this, it was delicious! I also made the quinoa. Lovely meal, and I love your blog. Keep ’em coming. I love salmon. This recipe looks sooooo good. It’s on my list to try. Your posts are beautiful and inspiring! I totally forgot how amazingly bright your blog is!!! This looks like an excellent meal. 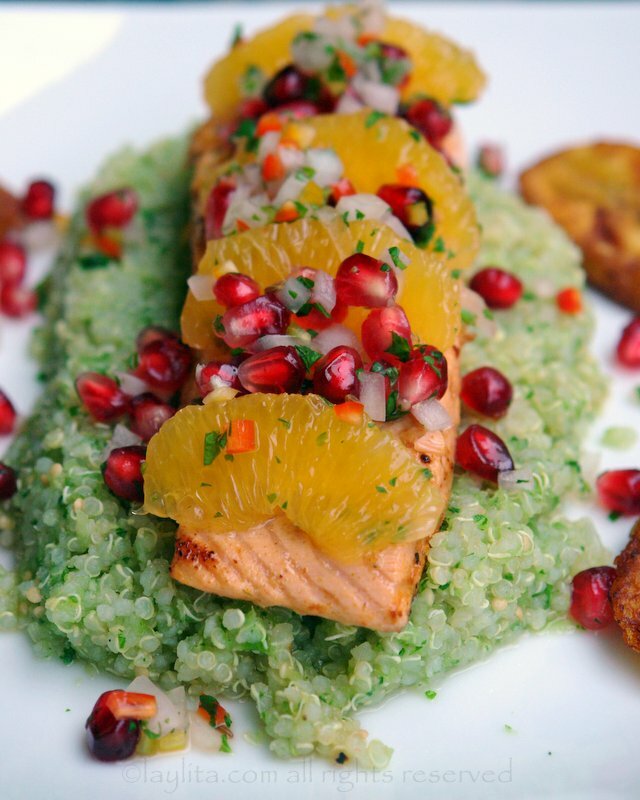 Love salmon with fruity salsa, and the addition of tomatillos to quinoa is a great idea! Beautiful and colorful…and great photos, as usual! 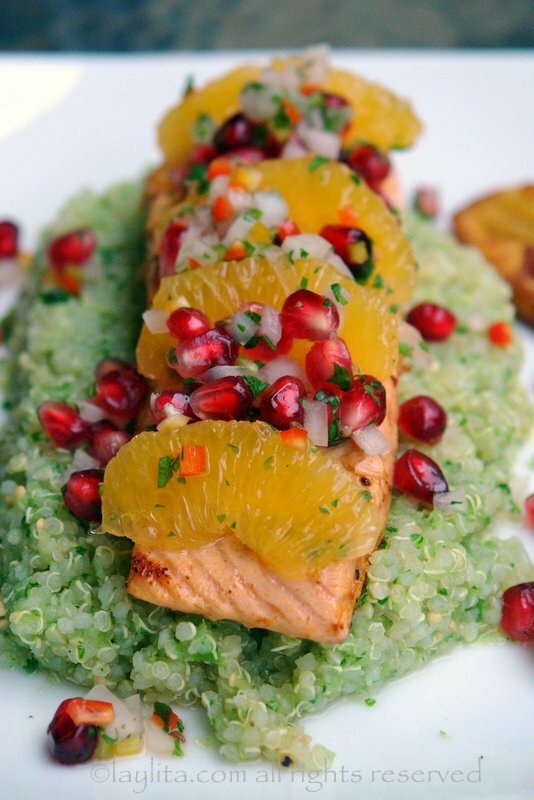 Love the idea of pomegranate with salmon. I have a small bit of pomegranate molasses left from the recipe I posted today — perhaps a pom vinaigrette with some salmon filets would be almost as good as your recipe. Thank you! Always a treat to get a notification you’ve posted something new…. What a tasty, colorful and healthy way to start 2009! This fish dish looks and sounds gorgeous! Heavens Laylita, your photographs are divine!!!! I am transfixed by the beauty of your composition and the deliciousness of the recipes!